The old version of SBLive will prompt for an .eax or .ea2 file. The new version of SBLive will prompt for an .aup file. 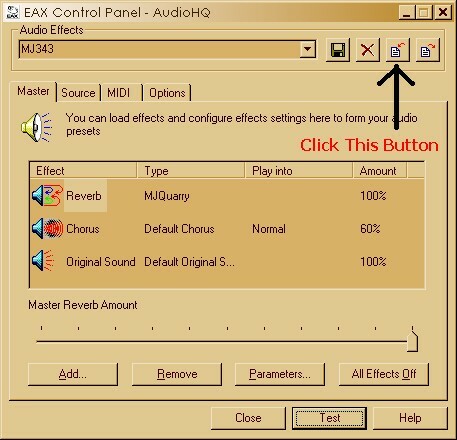 Once imported, either will create an immersive reverb environment, which should now appear listed on the Audio Effects pull-down menu, as shown in the picture above. Once installed and selected as depicted, playing one of the MIDI tracks that recommend the effect's use, will give the track its dues. Bill Hicks has some brilliant common sense views on marijuana. Click Here to hear a 470KB MP3 file from the CD "Relentless"
These should be looped to allow the ethereal feel to sink in. Having collared a free Dance E-Jay CD off a pack of Golden Nuggets, I created this track called Higgledy (1.6M), date 17th July 2003. Instant Rave tracks. Simply loop one of these for an all-night rave/skank up. "This is You" OGG Loop (600K) from my 1st CD "We like things..."
Loop from Synths 4 (2.7M) - if you "get" the rim shot in this piece, you surely understand rhythm. One thing I have learnt from doing these loopable files, is that MP3 format is simply no good because they always leave a noticeable gap where the loop ends and restarts. OGG format is brilliant in that it achieves the same, if not better, compression, and it loops perfectly. The sound quality is very good too. Usually, WAV format is still too big for current internet technology. This ZIP file (317K) contains .inf and .acm files which can be installed under Windows to support OGG format in WAV files (right-click the .inf file under Explorer to install it). I like the quality of sound at 22kbps 11KHz Mono, despite that being a streamable format over a 56K modem! The compression is superb, with 1 hour taking up about 9 MBytes. Make sure that you use MODE3 or MODE3+, since these give the best results. You'll need to add a string to the registry at location HKEY_LOCAL_MACHINE\SOFTWARE\Microsoft\Windows NT\CurrentVersion\MCI Extensions in order to play .OGG files. I added a string called ogg and set its value to MPEGVideo. This allows Windows Media Player (any version) and MJPlayer to play .OGG files. GoldWave supports OGG format and is the best audio editor on the market. MIDI files are also a bone of contention when it comes to looping. Cakewalk will only loop a certain number of times (has to be specified on each bar too - crap! ), and Windows Media Player leaves a nasty gap as the loop ends and restarts. Check out the gap left when Windows Media Player plays one of my shorter MIDI files repeatedly (try mj5n.mid), and compare this to Evolution MIDI's handling of it. These are an assortment of FLP files produced by Fruity Loops (see Great Downloads section). I use standard samples (unless noted next to the track) so you should be able to simply open these and play them. Groove on!